The mission of FIDV-Beit Halochem (House of the Warriors) in the United States is to care for Israeli servicemen and women wounded in the line of duty who are now disabled. At our state-of-the-art rehabilitation centers in Tel Aviv, Haifa, Jerusalem and Beer Sheva we serve more than 51,000 disabled veterans and family members. We raise awareness and funds for a broad range of social, cultural and sports training programs, offer scholarships, develop new initiatives, and provide specialized equipment for the centers. We help empower them to rebuild their lives. 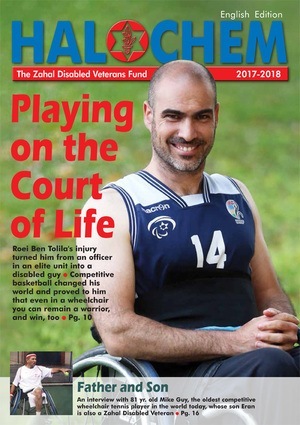 Friends of Israel Disabled Veterans (FIDV)–Beit Halochem is committed to caring for Israeli servicemen and women disabled in the line of duty, and victims of terror attacks. Beit Halochem centers provide therapeutic treatments, sports and recreational facilities, cultural and educational programs, scholarship support, and family-oriented activities to help them resume lives of purpose and dignity. In the United States, FIDV–Beit Halochem, a not-for-profit, tax exempt [501(c)(3)], organization is the only authorized institution whose purpose is to facilitate the rehabilitation of disabled Israeli veterans and victims of terror at the state-of-the-art Beit Halochem centers in Israel, which for many become a kind of second home. FIDV works in cooperation with the Zahal Disabled Veterans Organization (ZDVO), which was established in 1949 in the wake of the War of Independence. ZDVO’s purpose was to provide the 6,000 disabled veterans from that war with everything they needed to succeed in the long process of rehabilitation at the Beit Halochem centers. Since that time thousands of new members, wounded during their active or reserve services, and survivors of terror attacks, have joined Beit Halochem’s ranks, which today number more than 51,000. The Jewish world owes an immeasurable debt of gratitude to the men and women who have protected and defended Israel with courage and determination. Additionally, we owe much to the fearless Israelis who by living in Israel secure this tiny land for all the Jewish people. FIDV celebrates the men and women who protect and serve Israel: we commit to raising critical funds for the many specialized therapies, programs and unique opportunities offered by Beit Halochem to the people served by our centers. At Beit Halochem we do it all! At FIDV-Beit Halochem we take very seriously our commitment both to our donors and the people we help. In the interest in transparency, we are posting on this site some information and documents about FIDV-Beit Halochem’s governance and financial practices for our donors to review. We hope that you will find this helpful in better understanding the work FIDV does, and how this organization strives to be a good steward of the gifts and grants we receive. Thank you.